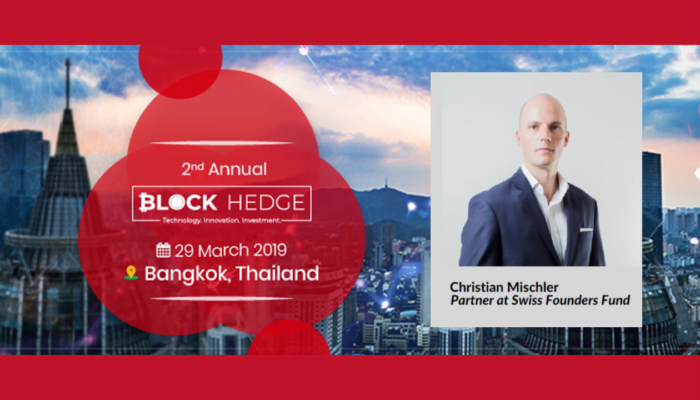 Here is what Christian Mischler, Partner at Swiss Founders Fund has to say about Block Hedge Conference. Q: Where do VCs invest in this crypto bear market? And what do you actually see in a company before investing Millions of Dollar? Blockchain technology is a) an alternative way to address real-life problems that previously were hard to solve, and b) an ecosystem in itself that has the potential to develop and capitalize on. It’s very hard to predict. We are used to making illiquid investments, and we know that the life of a startup is one of the rollercoasters. The intrinsic value of investments can rise significantly over time, but there are often also corrections or at times complete write-offs. We try to assess the potential of a startup thoroughly before making an investment and then back the team beyond financial means once we are part of the journey. Swiss Founders Fund invests long term and tries to contribute to the startup’s success wherever possible. Markets will stay volatile. The market is a basket of early-stage companies, many of which raised large amounts of money at incredible valuations. Corrections in valuations are inevitable but thanks to the large funding of these startups, they will be able to develop products that eventually will deliver value. This may take some time and the ones who did not manage their treasury well over 2018 might struggle to deliver against their timeline, as funds will get tight. However, I remain confident that the ecosystem and the asset class will be stronger in every aspect after this current crypto winter. The overall market will recover in terms of total capitalization, it’s only a matter of time and patience.